Saturday, February 2nd was Ground Hog Day and according to Punxsutawney Phil, America’s most famous groundhog, it is going to be an early spring. Coincidentally, I drove to the North Fork of Long Island on the same day to gather my ingredients for my homemade gnocchi and experienced my own signs of early spring. A very happy customer who asked for a fork so he could eat his pie in the car. A man after my own heart. The temperature was a frigid 26 degrees but that did not stop the hoards of people lining up outside of Briermere Farms to get their pies and vegetables. After being closed for 1 month, Briemere Farms opened February 1st—a sure sign spring had arrived. 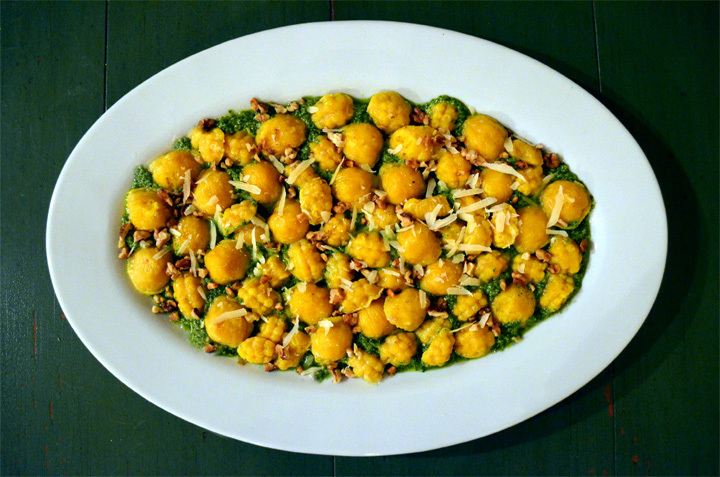 I grabbed a butternut squash and a few baked treats and headed on my way to Ty Llwyd Farms to get a dozen eggs, raw milk and kale for my gnocchi recipe. 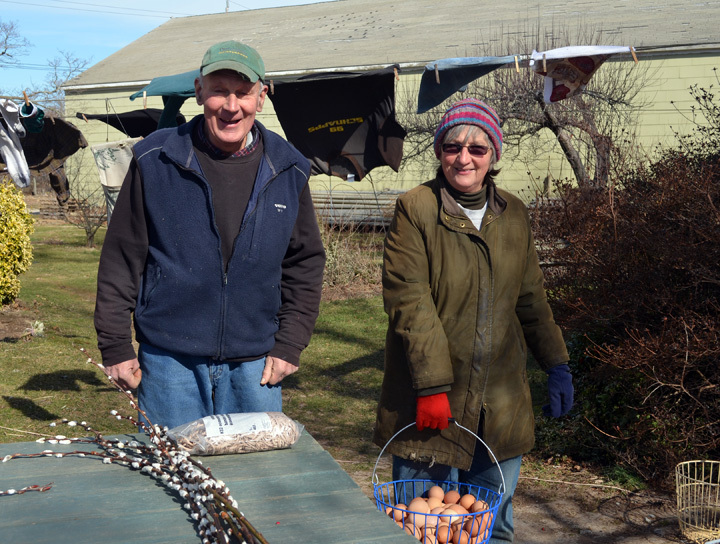 David and Liz Wines, owners of Ty Llwyd Farm with their basket of farm fresh eggs. Liz broke down and says, “I will give you both 6 eggs each, that is all I can spare.” I could not believe we were negotiating egg rations in the winter. How could this be? Naively I said, “You must have raw milk.” To my dismay, they were out of this as well. “We have had a busy winter, you may want to reserve your milk and eggs in the future,” Liz says. Thankfully, they had a hearty bunch of kale for my pesto and I remembered I made ricotta cheese from their raw milk that I had frozen. As I drove home, I felt partially defeated, yet inspired that people are rallying around the farms in the wintertime. 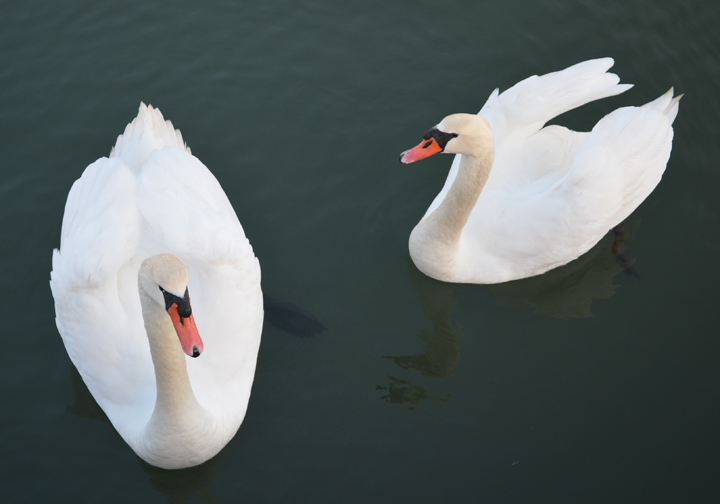 These swans are early this year in East Quogue, NY on the Shinnecock Bay. Possibly preparing their nests for an early spring. There was no need for a Ground Hog to determine if spring was coming early this year on the East End. If you plan on visiting Ty Llwyd Farm of Briermere Farms you may want to reserve your items ahead of time or get there at the crack of dawn. I have fond memories of my grandmother making homemade pasta. She would make different types; from her tuttaes (tortelli Piacentini), which were ravioli's from her hometown of Piacenza, Italy, to potato and ricotta gnocchi, which are Italian dumplings. My grandmother's homemade pasta: tuttaes (tortelli Piacentini), which were ravioli's from her hometown of Piacenza, Italy. Over the years, I have mastered a few of her pasta specialties especially her potato gnocchi. For some reason, I never learned how to make her ricotta gnocchi. The potato version are so delicious, why would I even bother? I now regret not learning her recipe; however, I recently took the leap into creating these pillows of love. I will be honest, my first hand at making these dumplings was a fail, and the worst part; I served them to friends who seemed to like them. The gnocchi were tough and floury. What would my grandmother think? The next day I persevered; adjusting my recipe that resulted in a perfect ricotta gnocchi. Let's just say I owe my friends a taste of this version, as they were not belly bombers but ethereally light. 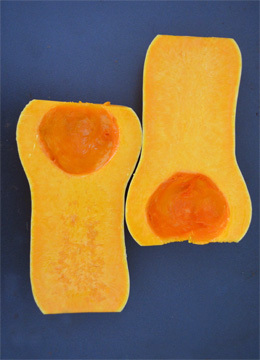 Cut the butternut squash in half lengthwise and remove the seeds. and place cut side down on a baking sheet. Roast the squash until tender, about 1 hour. Once cooled scoop out the squash, discarding the skin and puree until smooth in a food processor. Transfer the squash to a saucepan and cook over medium heat, stirring constantly, until liquid evaporates and puree thickens. Once squash cools place into a cheese cloth and squeeze out the remaining liquid. Then chill in refrigerator. This should equal out to 2 cups of puree. Place ricotta in a cheese cloth and squeeze out the liquid, then chill in refrigerator. It is very important that the butternut squash and ricotta are removed of their liquid the best you can. This keeps you having to add more flour to your dough which will cause the gnocchi to be floury and tough. Here is the recipe for homemade ricotta. Of course you can use store bought. In a large bowl, lightly fold the butternut squash, ricotta, parmesan, egg, nutmeg, white pepper and 2 teaspoons of salt with a spatula. Gradually and gently fold in 1 2/3 cups of flour, a 1/3 at a time, taking care not to overwork the dough. In the bowl lightly flour the dough and cover the bowl with a dishtowel, and refrigerate for 1 hour. The dough needs a gentle touch, so be patient. If you over mix you will wind up with a tough dough. To form the gnocchi: Flour your hands and the work surface lightly. Tear off a piece of dough about the size of your fist, returning the remaining dough to the refrigerator while you work. There are many ways to shape your gnocchi. Using a gentle back-and-forth motion, roll out the piece of dough into a rope about the thickness of your fore finger and cut the rope into 1-inch pieces. Then proceed on: a) using the 1-inch pieces as is, b) using a floured gnocchi board or a fork, lightly press with your thumb and roll the gnocchi to form ridges, c) roll the dough lightly between your palms to make a chestnut size ball or d) use wooden cookie molds to create beautifully designed gnocchi. Be sure to flour the cookie molds and press lightly into the board. Transfer gnocchi to a lightly floured baking sheet and chill the gnocchi in the refrigerator while you boil a large pot of well salted water. You can freeze the gnocchi for later use by placing the baking sheet with the gnocchi in the freezer. Once frozen, transfer to a ziploc freezer bag for easy storage. Add the gnocchi in batches, and cook until they float to the surface and then remove them from the pot with a slotted spoon. Drain off any excess water and reserve the pasta water to thin out your pesto if needed. 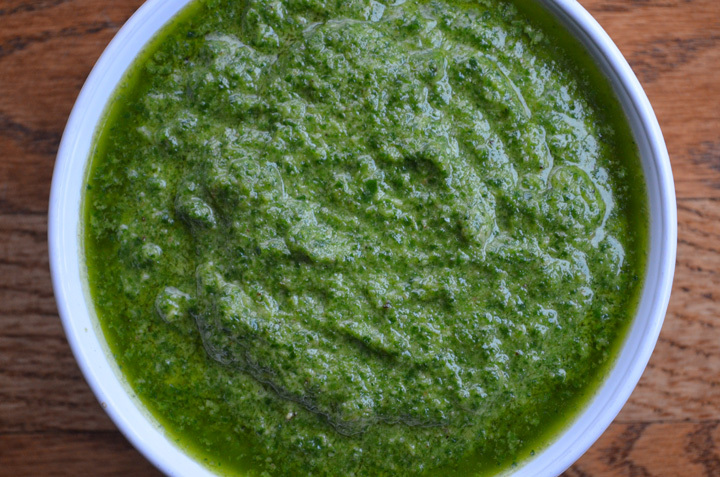 You can make pesto with any type of leafy green. The classic pesto we are all familiar with and adore is made with basil and pine nuts. Basil is a summertime herb here in the Northeast so in honor of the winter months I decided to make a nutrient rich, super green pesto made from kale and walnuts. Heat a frying pan over medium-heat. Add the walnuts and gently shake the pan until they are toasted. About 3 minutes. Remove walnuts from heat and let cool. Place the garlic clove in a food processor and pulse until it is finely chopped. Add kale, 1/2 cup of the toasted walnuts and Parmigiano-Reggiano and pulse until chopped. With the food processor running add the olive oil in a steady stream. Taste the pesto before you add any salt. The cheese naturally is salty. Then add some black pepper to your liking. Use the remainder 1/4 cup toasted walnuts for garnish. Note: The pesto should be completed before you make the gnocchi. If you want to thin out the pesto, place a dollop of the pesto in a large bowl, with the gnocchi and 2 tablespoons of the pasta water and fold gently. Here is hoping for an early spring.